Roller derby fans, this is a first for the Kansas City Roller Warriors, and the recent changes they’ve made mean we get our derby action months earlier than we would have normally. 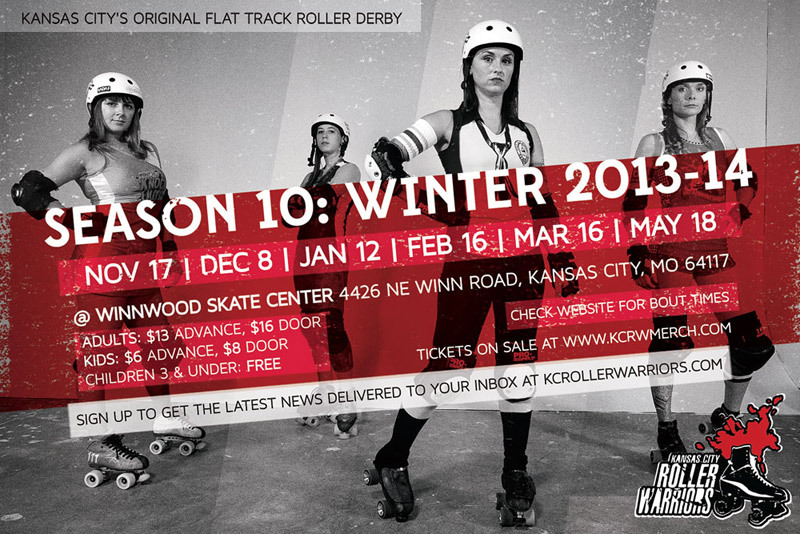 This Sunday afternoon, at Winnwood Skate Center in Kansas City, the Winter Season 2013-14 begins! Click to see the full-size graphic and game-day info. “The Kansas City Roller Warriors will be hosting the G.I. Jam, a roller derby event to benefit the Wounded Warrior Project on November 17. To show our appreciation for the service of our nation’s military, on November 17, 2013 KCRW is teaming up with the Wounded Warrior Project to present a military-themed double header bout, a portion of the proceeds from which will go to help further the WWP goal of honoring and empowering wounded service members. The first bout will start at 3 p.m. at Winnwood Skate Center, 4426 N.E. Winn Rd., Kansas City, MO. Angry Berta, Ash Ketch Em, Golden Meanie, Hella Hitzgerald, JenOOH!cide, Love Tap, Lunesta, Mayhem Meyers, Mexicutioner, Peanut Butter Panic, Remy Killjoy, Tara Tendon, Technalongi, and the legendary Xcelerator! Erin No Bragh, Hacksaw Hattie, Hey You, Hydrogen Bombshell, Impale Ale, Madam McBomb, Nancy Pants, Raia Sunshine, Rayna Payne, Reptar, Rump Wrecker, Stratus Fear, Twisted Momma, and Vespa! Annie Maul, Bruz Her, Bonita Bandita, Bubonic Peg, Buffy Slammers, Decker, FO, Hoss, Jamalamadingdong, L. Chupacabra, Road Hash, Ruth Canal, Shady O’Dread, Shirley Gonnahitya, and Skamakazee! Barbrarian, Betty Jean, Black Ice, Enigma, Fat Lips, Jade Lightning, Mary Lou Wretched, Pandamoanium, RamRam, reCycleHer, Sk8l Attraction, Sneaky Pete, Trauma, and Tuff Noogies! 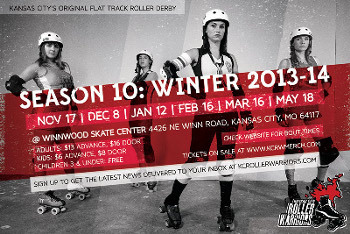 We hope to see you all out at Winnwood Skate Center this Sunday afternoon for Season 10!